Workbench Cabinets,Workstation Cabinets,Desk Cabinets - American Workspace Inc.
LISTA Bench Height Storage Cabinets are perfect for workbenches. Some models have a removable 6" base which allows the cabinet to also be used at desk height (27-1/2"). LISTA NS600 Workbench Height Storage Cabinet for tools, tooling, parts, hardware, or other high value items requiring safe, secure, and well organized storage. LISTA NW600 2-Drawer Workbench Height Storage Cabinet for tools, tooling, parts, hardware, or other high value items requiring safe, secure, and well organized storage. NW600 3-Drawer Bench Height Storage Cabinet for tools, tooling, parts, hardware, or other high value items requiring safe, secure, and well organized storage. NW600 4-Drawer Bench Height Storage Cabinet for tools, tooling, parts, hardware, or other high value items requiring safe, secure, and well organized storage. LISTA MP600 4-Drawer Workbench Height Storage Cabinet for tools, tooling, parts, hardware, or other high value items requiring safe, secure, and well organized storage. 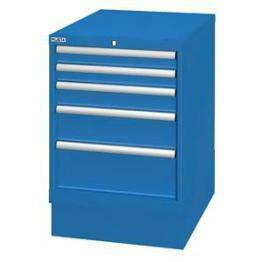 MP600 5-Drawer Bench Height Storage Cabinet for tools, tooling, parts, hardware, or other high value items requiring safe, secure, and well organized storage. MP750 4-Drawer Bench Height Storage Cabinet for tools, tooling, parts, hardware, or other high value items requiring safe, secure, and well organized storage. MP750 5-Drawer Bench Height Storage Cabinet for tools, tooling, parts, hardware, or other high value items requiring safe, secure, and well organized storage.